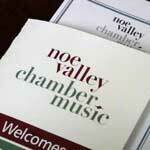 Noe Valley Chamber Music is a nonprofit organization founded in 1992 that presents chamber music performances by the Bay Area’s most outstanding artists and ensembles in warm and intimate concert venues. Their series allows both established and emerging local artists to perform new, old or unusual repertoire in an acoustical gem of a performance facility. NVCM offers concerts of excellent quality at an affordable price (tickets are $15-30, children 12 and under are free), and high quality concerts for kids, Classical Kids, as well as opportunities for audience participation and socialization. They often facilitate discussions between artists and the audience, asking performers to talk informally about their music from the stage so that the community experiences the music in the authentic chamber music tradition. Please note: All concerts during will take place at the Noe Valley Ministry.